We all know that email marketing is a fast and cost effective way to reach both existing and potential customers and because it’s a channel of choice for many organisations, particularly those in the e-commerce world. For this reason, it’s important to get it right. In the quest to create that perfect email, many have been known to spend countless hours agonising over subject lines, opening sentences, call-to-actions, quirky prose and personalisation. However, while these efforts are noble, there will always be those who ignore the message and scroll straight down to the unsubscribe button. So what happens then? It’s tempting to bury the unsubscribe button deep in the footer of the message and hope that the annoyed subscriber will simply give up their search – however there’s a good chance they’ll just opt for the ‘report spam’ option. 1. Let people unsubscribe as easily as possible. You should have the unsubscribe button clearly visible by placing it both at the top and bottom of the email in a nice, strong font colour – not hidden amongst existing text in an obscure off-white shade that requires you to squint to find it. Once they’ve found the button, you should also avoid making them log in to unsubscribe. The reason for this is pretty clear – being forced to log in will just cause frustration and will heighten the chances of your email being reported as spam. 2. Avoid using the one-click unsubscribe method. This may seem to contradict the previous point I made about letting people unsubscribe as easily as possible – after all, wouldn’t one simple click be the easiest method? The truth is, sometimes people will accidentally click ‘unsubscribe’ (I’ve certainly done it before) and if they’re automatically off your list, you’ve just lost a potential customer. Of course, they can always go onto your website and go through the process of entering all their details, subscribing, then confirming their subscription once more but unless they absolutely can’t live without your emails, many people would avoid doing this. Give your subscribers profile options after they’ve hit unsubscribe rather than automatically deleting them off your list. Allow users to either pick the frequency of emails (i.e. every day, once a week, once a month – whatever you want!) and if appropriate, allow them to choose the categories they’re interested in. 4. Set expectations once the user has clicked the unsubscribe button. Confirm that the user has indeed unsubscribed. Some email marketing systems take a few days to register the unsubscription and if this is the case for you, make that you make that clear for the user so they don’t pull their hair out in annoyance when they receive yet another email from you. 5. Ask for feedback to find out why they’re unsubscribing. Maybe they find the content isn’t relevant or high in quality, maybe a particular campaign offended them or maybe they felt that they were receiving way too many messages each day. Regardless of what the feedback is, it could be really important for future email marketing efforts. Of course, don’t make this process to complicated – limit it to a few multiple choice options or provide users with an optional ‘feedback’ box. 6. Throw in a few LOL’s. 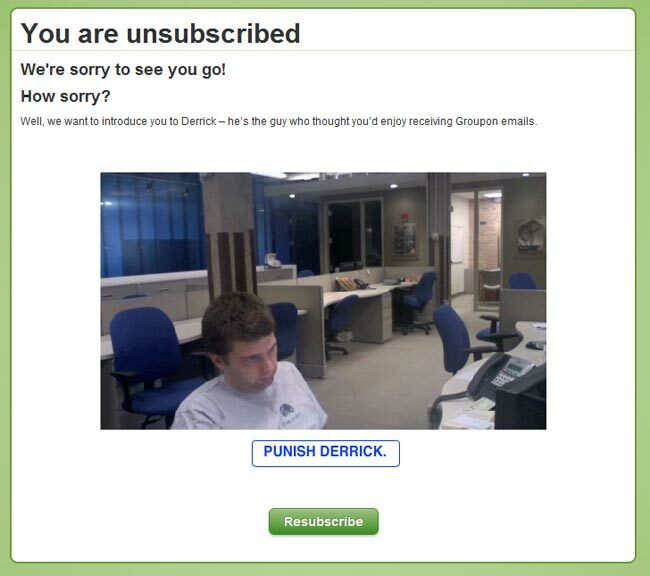 Groupon did an awesome job of joking around with their unsubscribe page with their ‘Punish Derrick’ campaign which allowed users to, you guessed it, punish the guy who sent the emails – Derrick. This adds the often missing human element to the email and even if it doesn’t stop people from unsubscribing, at least you’ll make a few of them smile! All in all, when it comes to creating unsubscribe pages, make it as easy as possible for subscribers, give them options, ask for feedback, set expectations and joke around bit. 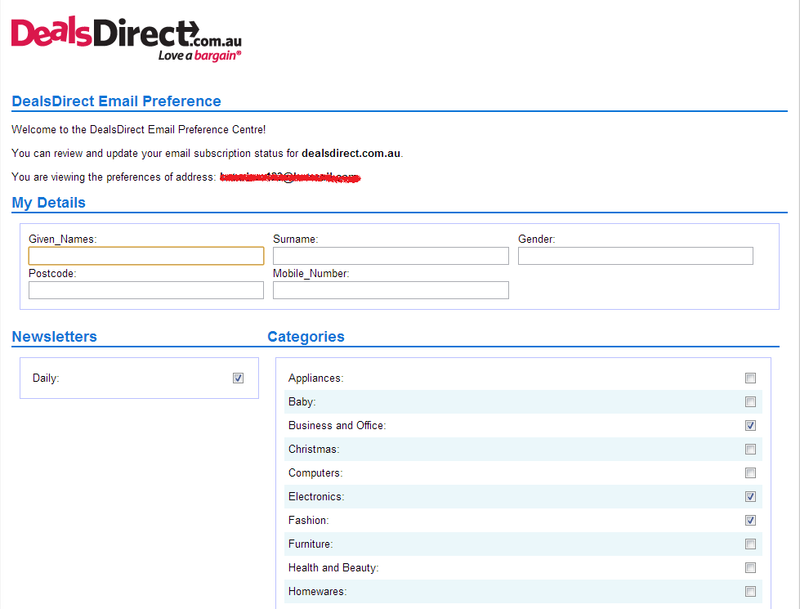 Without this, you’ll risk being labelled an exasperating spammer – a label that no company wants.